What do you call a collection of four mothers from the same family? A Mothering Sunday! Yesterday we gathered at the home of the Middle of the Darling Daughters (five days after delivering her baby by Caesarean section – there’s no keeping some people down) for a traditional Mothering Sunday Celebration. According to my Son-in-Law (the one who likes to put forward an alternative view of just about everything) the day has its origins in the pagan festival of Hilaria. Which seems remarkably appropriate as the Middle of the Darling Daughters, celebrating her first ever Mother’s Day, is Hilary by name. The only people unable to join us were the Little Welsh Boys and their parents but as the boys have succumbed to the chicken pox this was doubtless a Blessing In Disguise. To make up for not seeing them, My Boy sent me a video of young James strumming the guitar and singing his own version of that well-known song “Happy Mother’s Day”. You haven’t heard it? You don’t know what you have missed – the words are easy enough to learn, just “Happy Mother’s Day” over and over again and the tune is, well, similarly repetitive but in the loveliest possible way. The Youngest of the Grand-daughters, Eleanor, had brought her knitting with her, desperate to finish off the Bluebird of Happiness she had been making (courtesy of a knitting pattern supplied by yours truly.) Between us, over the course of the afternoon (between cuddling the baby and other diversions) we knitted the tail and the one remaining wing and sewed it altogether, enabling Eleanor to present her finished bird to her Auntie before she had to leave. It was a close call but when Eleanor and I get knitting there is little that can stop us. The Bluebird of Happiness will soon be winging it across the nursery ceiling along with all the other birds. Over the course of the day, we had more than 20 visitors, of the large and small variety. They brought presents and good advice and lots of love for the newborn and his happy parents. Fortunately the visitors were well spaced out so we had plenty of time to replenish the sandwiches and the salad, the pizza and the tiramisu, the cinnammon whirls and the brownies. I like to think of the servant girls and boys in Victorian times given the day off to visit their mothers and gathering flowers from the woods they tramped through on their way. I wonder if their visits home made their mothers cry? My flowers, cards and gifts as always made me weepy – but my tears were nothing compared with those of the Middle of the Darling Daughters, presented with a “1st Mummy’s Day card” by / on behalf of her tiny son. 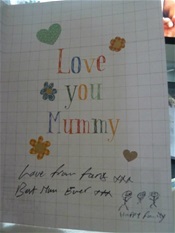 “Best Mum Ever” was written inside, together with a line drawing of three people with “Happy Family” written underneath. That boy will go far. He already has his mamma totally sussed.